clients, specialized solutions in order to counter any anthropogenic and natural threats. STAM also provides advises and unparalleled consultation on population dynamics, including socio-economic, political, and cultural trends. Our personnel brings to you decades of experience of working in identity conflicts, tribal and clan dynamics, and complex security environments. Our documented procedures, developed in conjunction with external legal counsel, ensure compliance with relevant UK, US and EU legislation. STAM supports its clients , both governments and corporations in research ,development and implementations of new defense, security solutions and policies , to prevent modern future threats . STAM advises governments and corporates to identify key security related risks and help develop solutions to manage them. Our perspective is wide, encompassing solutions focused on improving traditional security as well as long-term stability. Our work with industries focuses on the security system as a whole, and involves developing security policy, interface with government bodies, and crisis management planning. STAM consulting team supports its clients – both governments and corporations , to secure their critical infrastructure against targeted and untargeted threats. We help identify key vulnerabilities in light of situational risk, identify security solutions for physical assets, including technology-based products and services, and manage implementation of those solutions through a best practices Project Management Office and Tactical Operations Center. We assist customers all over the world in cases of legal detention, missing people and the international legal assistance thanks to the relationship of fellowship established by Amoruso & Partners. Step by step we follow our customers with the ability to immediately enter into contact with national specialized law firms , with our interpreters and our ability to fully analyze every question. Above all with circularity of confidential information and authentic method. At STAM, K&R consulting are designed to protect individual and corporations operating in high-risk countries around the world. Our K&R consulting team brings perspective helping our clients to gain clarity and make better informed decisions about security and safe travel. Our Kidnap & Ransom consulting team is aligned around 4 pillars: anticipate, prevent, respond and recover; and helps our clients to make informed decisions. 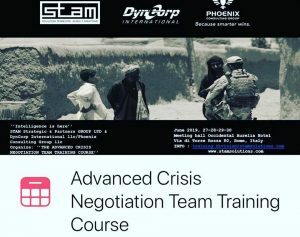 STAM Strategic & Partners Group ltd offers a technical consulting service, that starts from study of the specific demand of the customer and culminates in the offer of a custom-made and unique intelligence/security and defense. Services from step 1 to step 2 are free of charge with no obligation to proceed with the services.